The buses will form a key part of Go North East's ongoing work with partners to improve air quality, further enhancing the already good per passenger journey emissions of bus use, and will be the first latest generation full electric buses capable of all day service to operate in North East England. They will be deployed in service between Newcastle and Gateshead operating over the Tyne Bridge, a major Air Quality hot spot. Overnight electric charging infrastructure will be installed at Go North East's Gateshead Riverside depot, where the buses will be based. 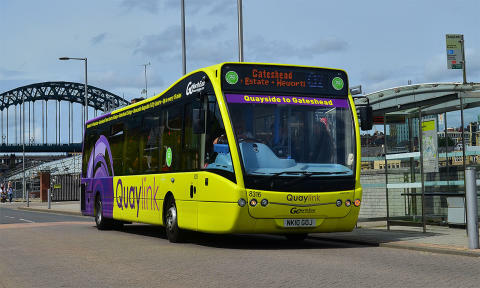 Commenting on the news, Go North East's Managing Director Martijn Gilbert said "Buses are a really important part of keeping our towns and cities moving, reducing congestion and improving air quality. We're therefore delighted to receive this funding to help support our investment in the introduction of full electric, zero emission buses that will make travelling by bus in the North East even greener. “These buses will build on our existing investment which has already seen over 170 low emission buses join our fleet in recent years, as well as an ongoing programme supported by local partners to upgrade the engine emission standards of much of our existing fleet, all further improving the carbon footprint of the 62 million journeys made by our passengers every year. Having just extended our January sale with some great value weekly tickets, there has never been a better time to switch to using our buses from a cost, environmental and health and wellbeing point of view!"